For my birthday shindig, which was last Saturday.. I already knew what I was wearing clothing-wise, but I wanted something that was sort of matchy.. Because I wanted to use Deborah Lippmann Happy Birthday as my accent..
Then Butter London Trout Pout came in to my life. I honestly could not be happier!! It is an amazing colour by an excellent brand. 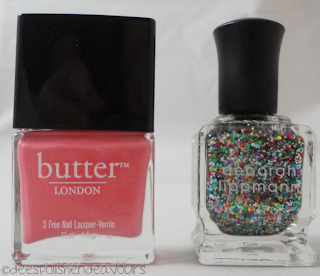 I actually think Butter London is quickly climbing to the top of my favourites list.. Which is great and sad - mostly for my wallet. That weeping you hear - yeah, my wallet. Though, as most people say: you get what you pay for. Yes, I have to shell out for cash for the Butter London, and I believe I get less in the bottle compared to other brands, but, I love it. The formula is perfection.. I have a few more on the way.. I think my eyes just glazed over. Enough with that hmmm.. I do apologize.. These photos were taken the day AFTER my shindig.. There was some intense games of quarters going on.. My nails are a little hurting, but you can get the general idea of this simple mani. OH! And.. Happy Friday the 13th! I am going to be spending the evening with my bff.. I'm hoping that means that something awesome will happen to us because of this day.. Here's to hoping, right?! 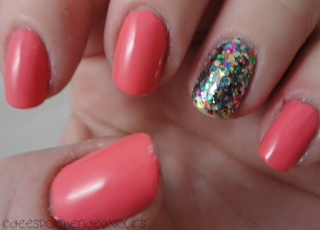 Liking the sparkly accent nail and I have strong lemming feelings for Trout Pout!